Clogged tube again - please pray! 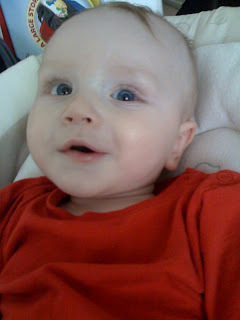 Timmy seems to be teething again, so I put some infant Tylenol into his feeding tube. Apparently that's pretty sticky stuff, and the tube is once again clogged. Lauri and I are trying desperately to unclog it and avoid a trip to the ER. 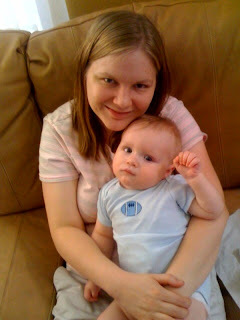 Please pray that we won't have to go to the ER, and that if we do, that the Clog Zapper treatment will work again and Timmy won't have to be poked until we can plan for it better. I'm working on a more interesting post, but for now I am wondering if any of you who visited us in the hospital are looking for a lost Motorola phone charger? 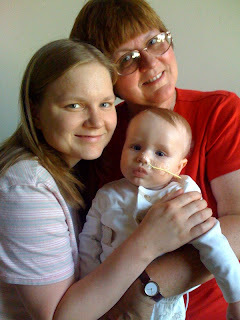 I am still sorting through the stuff that we brought home from the hospital, and it was in there. 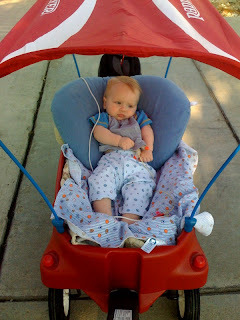 We used several different birthday gifts to buy Timmy a fun wagon for walks around the neighborhood. It even has a sun shade and a rear storage bin that is perfect for carrying his feeding pump. We got home around 9:30 last night. It was a good trip. A very good trip, I would say. Sadly, there was no promise of a miracle cure. However, it was great to talk to someone who had so much experience with mitochondrial disorders. It was helpful, although perhaps not what we wanted to hear, to know that he agrees that it most likely is Leigh Syndrome. He suggested some vitamins and supplements to try that have given some very good results in other kids. He said that the odds are good that Timmy will live 1-3 more years. If he gets an infection, that could shorten that time frame greatly. Or he could be one of the kids who hangs on a long time. In the end, we know that the Lord is the one who numbers our days, but that at least gives us an idea from an earthly perspective of what the future MIGHT hold. When we left, I had many fears about the trip. And I am thankful to say that the Lord provided. 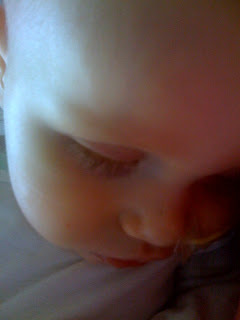 I was scared that Timmy wouldn't get enough rest (he mostly did), especially at night in the car (he fussed until I thought he might puke or have a seizure and then he fell asleep instead - in both directions. 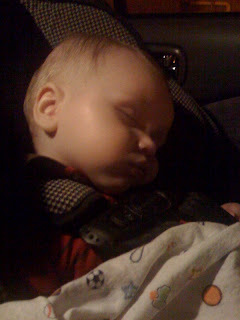 Then he woke up just 5 minutes or so before we got to our destination). 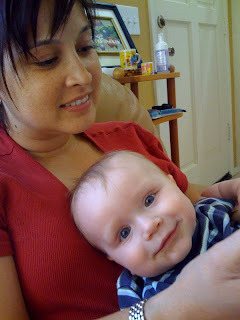 I was fearful that he would puke or have seizures (he didn't do either). I was afraid that we would go all that way and then only end up seeing the doctor for a few minutes and that he would be in a hurry to see the next patient (he stayed with us for over 3 hours and answered all the questions we could think of!). 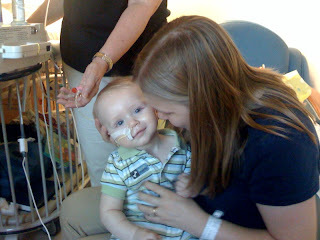 I was afraid that Timmy would get poked a lot (especially when I saw how many vials of blood they wanted), but they were able to get tons of blood for lots of different tests with just 2 pokes. The other test they did was with a saliva sample from the inside of his cheek. How easy is that! there and back and that it will be time well spent. Today has been going great. No episodes of stiffening or puking. Decent naps. The feedings are at 45 ml per hour with 5/6 formula and 1/6 pedialyte. So that is almost back up to the goal amount of formula. I confess that I get nervous just thinking about adding that final 1/6 of formula. But it amazes me how much better Timmy does when he is actually able to get nutrition and keep it down. 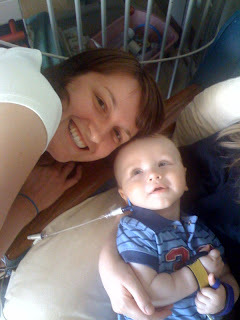 He is just more smiley and interactive and sometimes it seems to even help his head and torso strength. It convicts me to eat better. Please continue to pray that he will get good naps and good nutrition that he can keep down. Thank you again for your prayers yesterday. 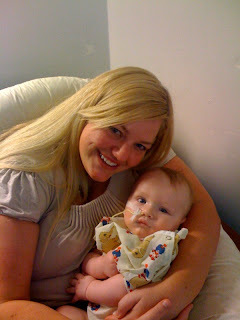 I am so thankful that we didn't need surgery to replace the tube and that we are home again. It took a while but the tube is unclogged and we are headed home. Thank you, Jesus!!! If it had not unclogged, it would have meant another surgical procedure so we could not be more thrilled. Thank you, thank you, Jesus! 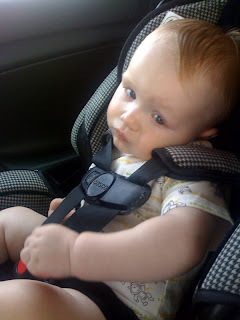 We are headed to the hospital to get the super de-clogger treatment. 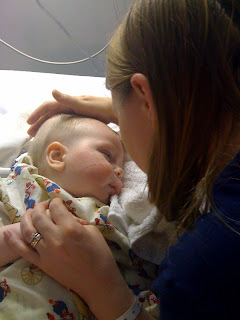 Please pray that it will work quickly and that Timmy won't need to get poked. Timmy's tube is clogged. Please pray that we can get it unclogged easily. One random nurse trick for unclogging tubes is to try to put soda into it. Of course in our house, Diet Coke is usually available. He seemed interested in it so we gave him some. He liked it! For those of you who are interested, Nana has posted the pictures from their California trip to her Flickr account. In honor of Nana's pictures, I have included the picture she took of Timmy at his party as everyone was singing "Happy Birthday." His huge grin just shouts, "Everybody's singing for me??!!? I love singing!" That was one of Mama's favorite moments! And speaking of the party, thank you all so much again. 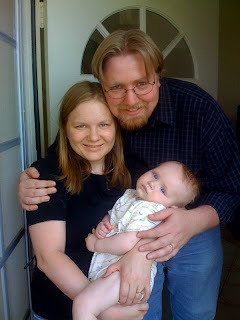 That was just a really special day for our family. Timmy was doing so well and was so excited to be the center of attention. We really appreciate each of you who organized or decorated or sent gifts or cakes or participated in any way. Don't forget to look at the pictures in the photo gallery. If you have any more to add, you can either choose "upload" or email them to me and I'll do it! We are slowly settling into life at home. 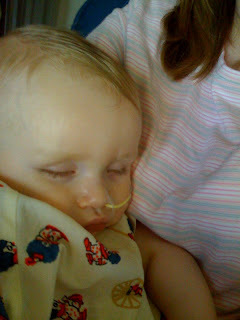 After a call to GI, we are making some adjustments to Timmy's meds, so that should hopefully take care of the puking. So far so good today. 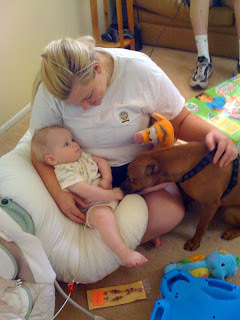 Also a home health nurse came by to check on us today, and she was very nice. She had done her homework ahead of time and actually knew what a mitochondrial disorder was! She seemed thorough and kind. I am glad to hear that she will come by once a week for the next few weeks. As always, please pray for wisdom and for no puking or seizures. Please pray for us all as we adjust to this new normal. 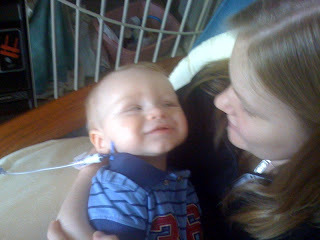 He is doing so much better than his lowest at the hospital but so much worse than the last time he was home. I think that the change in location points out the behavioral and physical changes all the more. It is just so hard to see him be so weak. I miss him holding up his head and standing and being more interactive. 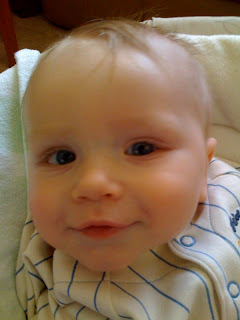 He is smiling and giggling a little bit though, which really does an emotional world of good. I know it is a good day if I yawn and he laughs at me. For some reason he has always thought that yawns are SO funny - especially loud, exaggerated yawns. Timmy slept through the night and so far has not puked today. I am thrilled to say that after an hour of rocking and dancing and singing, I was able to put him down to nap in his crib. So clearly I need to shower while the getting is good! Who knows if he really meant to wave? But either way it sure was cute! Wow. Life at home is quite the transition. It probably is for EVERY kid that is in the hospital for a long time. But it has already been quite the blessing and the challenge. I have already cried tears of both extreme joy and extreme frustration/stress - and it hasn't even been 24 hours yet! Yesterday after we got home, Timmy had a lot of vomiting. In a moment of panic, I called one of my nurse friends and she kindly reminded me of what things the doctors have done in the past when this happens. Sometimes we just need someone to help us to stop and think. Clearly, Timmy has puked before. And each time it happened before, we followed the same pattern of care. So I will try to do that same thing at home. 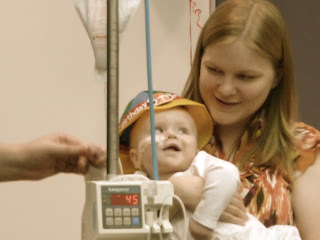 Although I appreciate the doctors and nurses, it is difficult to describe how much damage the chaotic atmosphere of a hospital can do to a kid with a mitochondrial disorder. Unless I am sure that there is a specific thing that Timmy needs that can only be provided by the hospital, I do not want to go back. Thankfully, Timmy slept most of the night last night. Today we resume our daily routine. I will be working towards putting his body back on a normal sleep and play schedule. This means that for now, we (Lara and Timmy) will not be taking visitors or phone calls from 9-11 AM and 1-3 PM (and 5-6 PM as needed) each day. I notice that sleep makes a HUGE difference on Timmy's strength and also his agitation/relaxation level. So we will be taking at least these 4 hours each day so that we can rock and cuddle and sing and slow dance (and hopefully SLEEP). Please continue to pray for wisdom for me as I become Timmy's primary caregiver. "There are no scientific studies documenting that childhood vaccinations cause or worsen mitochondrial diseases, but there is very little scientific research in this area. Mitochondrial diseases are as prevalent as childhood leukemia, however the National Institutes of Health devotes only $11 million a year to research into mitochondrial disorders and only about one-third of that is earmarked for primary mitochondrial disease research. Many scientists believe unmasking the causes of mitochondrial disease may lead to possible cures for Parkinson's, Alzheimer's, heart disease and cancer." 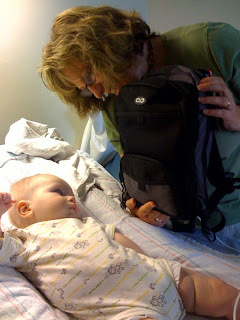 Here is Timmy and Nana with the new backpack feeding pump. Heading to the car now. The doctor came through, Nana and Papa are here, and now we are waiting for the feeding pump to arrive. Our bags are loaded into the hospital wagon. Nana and Papa are on their way over. We have our prescriptions. So as soon as the feeding supplies are delivered and the doctor answers our final questions and signs us off, we are OUT OF HERE. Hopefully it can happen before the heat kicks in outside. The GI doctor agreed to put us back on Nutramigen for at least a month so that we can still go home tomorrow. 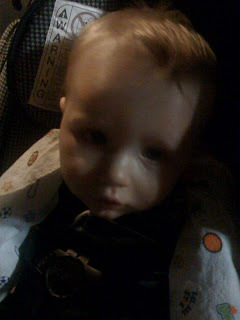 They put Timmy on the "big boy" formula and he had an allergic reaction. Please pray for wisdom as we decide what to do next. We had a great night. 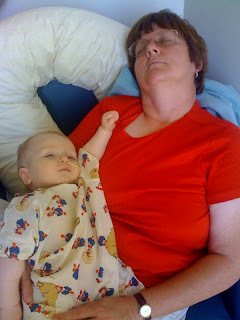 The nurse gave him a regular dose of Tylenol overnight, and Timmy slept until 7 am! He is awake and cheery this morning. A subtle thing to notice in this morning's picture is that Timmy is turned (by himself) to the right. When Timmy is in pain, he keeps his head turned to the left and does not want to look even to the middle. So this is really encouraging to me. This morning, Timmy will start to get food through his new tube. We will start with Nutramigen. Then we will see what timing the doctors suggest for changing to a formula that is more appropriate for a big one year old like Timster. Hopefully we can go home real soon, but I'm not sure exactly when. 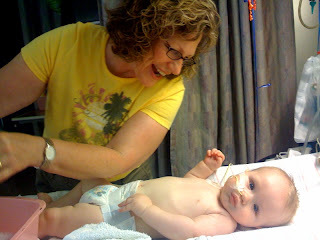 Today's picture is Nana giving Timmy his pre-surgery bath. As you know, Timmy had his surgery today. In the end it was a laproscopic procedure, and it went well. 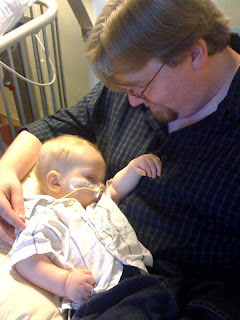 Timmy had a little bit of vomiting and one short seizure after the procedure was over, but the last several hours have been great. It is so nice to have Marshall's family here this week. We have moved from party mode to surgery and recovery mode. The aunts and uncle and cousin have been helping around the house and coming to the hospital off and on for visits and to give Mama some time off. Yesterday we took Timmy out to the courtyard in a wagon so that we could all eat pizza together there. It is especially very fun to watch the cousins interact. It is such a blessing to have friends and family around who love us and are taking such good care of us. We are so thankful for all of the family members and friends who have come from both near and far to love on us in this challenging time. Thank you again to all those who have visited us, prayed with or for us, been an advocate for us, given me time off, lent us a car, given gift cards or birthday presents, taken out our dog or done our laundry, or helped in any way to put together such a very special day for us on Sunday, just to name a few. I hope to be organized enough to get out thank you notes soon. But if I am not that organized, please know that each and every one of you is just so appreciated. Well, Timmy has been asleep for a while now so I should try to do the same. Timmy went in for surgery for the J-tube at around 11 AM, and it was a success! We're told he did very well. 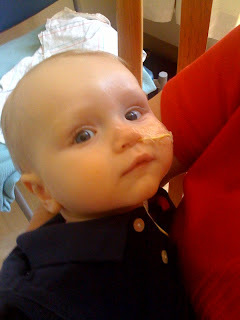 He no longer has the tube in his nose; there's a bit of a rash on his cheek where it was, but that should clear up soon. 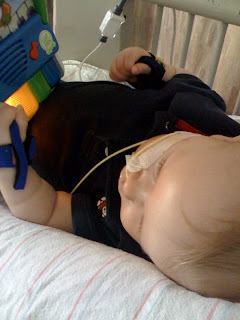 They put a larger tube into his stomach, and then used that to insert the smaller J-tube. In a couple of months, he should be able to have the larger tube removed and replaced with a "Mickey button", which will make it a lot easier to cover up. Timmy will need a few days to recover and to make sure everything's healthy, and then hopefully we can go home by the end of the week! It is 10:10 and Timmy is about to go down for his surgery. Please pray for the doctors and for quick recovery from the anesthesia. Timmy's surgery is scheduled for 10 am tomorrow. 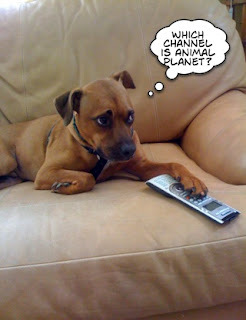 Even if it doesn't happen right at 10, the key is that we actually have a time slot. Yay! 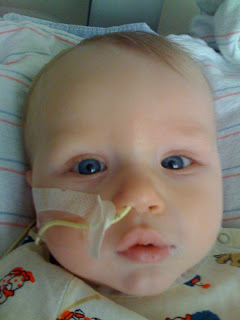 The GI team got too busy today and postponed Timmy's tube placement until tomorrow. It is 10:20 am and we still don't have a surgery time (and of course Timmy is hungry because we are not feeding him in preparation for the anesthesia). But we have a good nurse today and she will keep bugging the right people. And... (drum roll please) as soon as the papers are typed up and signed, WE HAVE BEEN APPROVED FOR FEEDING SUPPLIES AND FORMULA!!! That takes off a huge financial burden. Praise God! We didn't take many pictures ourselves from the party yesterday, but we've started an online photo gallery with a few that we'll be adding to. We know that there were plenty of you who were taking pictures, so if you have some to share, please upload them to the gallery so that everyone can see them. Thank you! 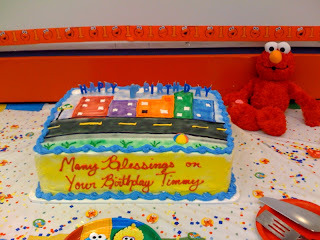 We had a very special dedication, lots of friends, a huge cake, lots of fun Elmo toys and decorations. Timmy seemed to have fun. He watched Pastor Mark intently during the dedication and got a huge smile on his face when everyone sang "Happy Birthday." More pictures to come. The family is beginning to arrive and preparations are happening for birthday and dedication celebrations. 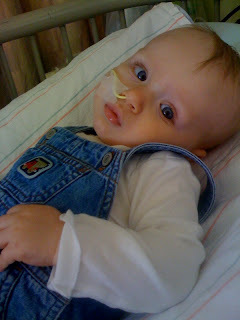 Timmy has had a busy but good day with wagon rides around the hospital. 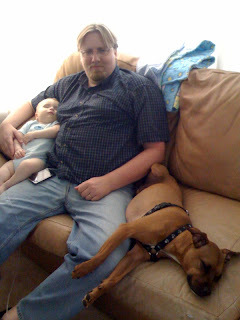 So right now he is napping with Daddy. Please pray for good health for all those planning on coming to the festivities tomorrow and that Timmy would not get sick before his feeding tube placement on Monday. We have been waiting for over a month for this, so please pray that it would happen as planned and that Timmy would be strong to get through it and recover quickly. Timmy has been having fun today hitting the buttons on his new learning piano that he got from his friends Jacob and Hannah and their mom. 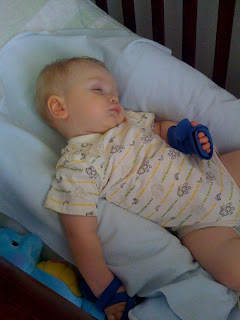 The splints on his hands are there to teach his thumbs to come out and play rather than being clenched inside his fist. 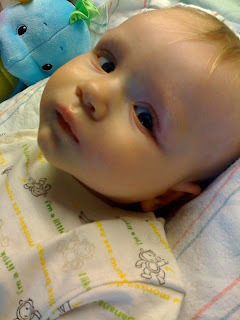 We are scheduled to put in a feeding tube (a G-J tube) on Monday (as long as the GI people don't get busy and postpone). Then hopefully Timmy will take a few days to recover and we can go home. We have really debated on doing the reflux surgery but have decided for a variety of reasons not to do it. Now that the tube placement is scheduled, we are planning for the birthday party and dedication to be here at the hospital on Sunday morning. One of the ladies who frequently comes to give me breaks at the hospital pointed out to us that Timmy's birthday is the day of the year when you can see the most shooting stars. The surgeons say that they think the Nissen is too risky, so we are looking at doing just the J-G tube. We are waiting to hear more details about the procedure and the timeframe. 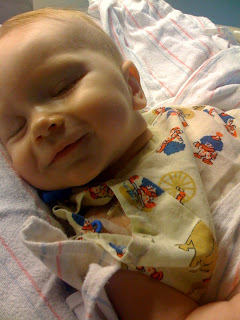 In the meantime, Timmy is smiling a bit more and giggling some. I am seeing hints of my little smiley child. 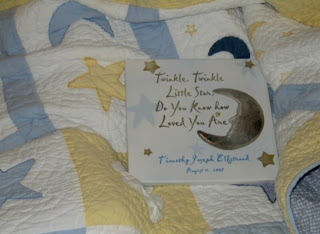 He certainly loves books and music like his mama. Please pray for financial/insurance arrangements. We are making some good progress, but it is slow and nerve-wracking. Also pray for Timmy's vision as his eyes seem to be shaking a little bit. Whenever I have faced hard times in my life, music has been one of the best therapies. Usually this has meant hours spent at the piano or keyboard, but right now I don't have the luxury of the time or the instrument at the hospital. Instead I have an iPod with music that Timmy and I can listen to together. So I thought I would share my list of songs that are really speaking hope to my heart right now. Do you have other songs that you could add to the list? I would love to know what they are. Timmy slept until 7 this morning. So we both got some good sleep. We are slowly increasing his feedings. 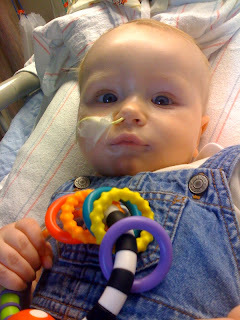 He generally seems better with the tube lower but is still showing signs of reflux even now. So we will continue to be watchful and see how we can best help him. Other than cuddling with my hubby there is nothing that compares to holding my Lord's precious little one while he sleeps. 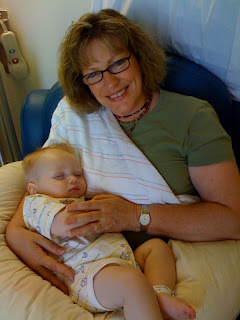 We had a somewhat tough night but Timmy is resting now with Oma. Today we will see how the new tube placement will go.